Haupia is a traditional coconut milk-based Hawaiian dessert often found at luaus and other local gatherings in Hawaiʻi. Since World War II, it has become popular as a topping for white cake, especially at weddings. 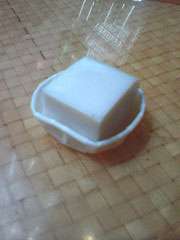 Although technically considered a pudding, the consistency of haupia closely approximates gelatin dessert and is usually served in blocks like gelatin. The traditional Hawaiian recipe for haupia calls for heated coconut milk to be mixed with ground pia (Polynesian arrowroot, Tacca leontopetaloides) until the mixture thickens. Due to the lack of availability of arrowroot starch, some modern recipes for haupia substitute cornstarch. Haupia is very similar to the European dessert blancmange. In the typical modern recipe, diluted coconut milk, sugar, and salt is mixed with arrowroot or cornstarch and heated until thickened and smooth, then poured into a rectangular pan and chilled as with gelatin. It is traditionally cut into small blocks and served on squares of ti leaf. Some recipes for coconut desserts actually call for unflavored gelatin in place of the cornstarch, but it would be erroneous to call them haupia. Many local confections that contain coconut or coconut flavoring are advertised as haupia flavored. Currently, McDonalds across Hawaii sell "Haupia Pies," similar to their better-known apple pies. Brennan, Jennifer (2000), Tradewinds & Coconuts: A Reminiscence & Recipes from the Pacific Islands, Periplus, ISBN 962-593-819-2, OCLC 44502471 .